Available for pick up Only. Sat from 12pm – 4pm. I care about natural foods because health is your wealth and it is my goal to share natural amazing tasting foods. 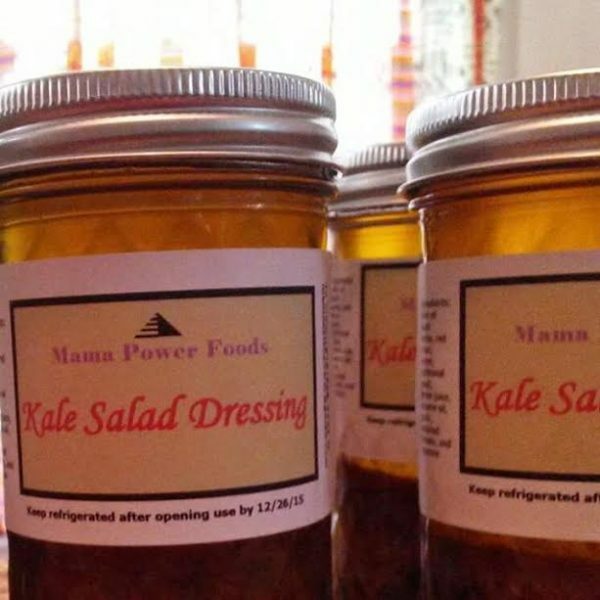 We specialize in a wonderful kale salad dressing. With our dressing it’s easy to eat raw veggies. Mama Power Foods was born out the need to get raw veggies into my children’s diet. Also, I love to host parties at my house. After a few get-togethers, friends and family who have never eaten kale salad started to request my salad for their gatherings. My kale salad dressing recipe has now taken me on this amazing journey of making it easy for people to eat raw foods. I care about natural foods because health is your wealth and it is my goal to share natural amazing tasting foods. Located in Decatur, GA we specialize in a wonderful kale salad dressing. We look forward to your order. With our dressing it’s easy to eat raw veggies.